This week’s blog post is about one of my favorite things, which is Halloween baking! Halloween is one of my favorite holidays because it’s fun. It’s one of those events that you can get a little crazy and just have a ton of fun. 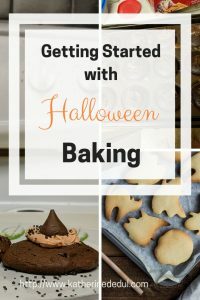 So this post will help you if you’re wanting to get into the spirit with a little baking, or maybe you have a party to throw and need some super awesome baking tips and ideas. So if that’s you, read on my friend because that’s what this post is about! So with baking, I like to have a few essentials always on hand. I never quite know when the baking urge is going to strike me, so here’s what I always like to have immediately available. You can get these at your local Walmart, maybe even a dollar store. You need something to hold your baking in while it bakes up in your oven. If you’re looking for something a little crazy, you may need to head online to find it. When I do shop online, I like to stick to sort of the known brands, because I trust their products. I mainly use Wilton, but I find Nordic Ware is quite good as well. Cake pans, these come in a variety of shapes, round, square and rectangle are most common. Those three types should be more than enough to get you going on most recipes. Check your recipe to see what it calls for and shop accordingly. A lot of recipes will call for you to mix the wet and dry ingredients separately before combining. So you need at least two sizeable bowls to accomplish this without tearing out your hair. I prefer metal or glass bowls to plastic because they last a bit longer and are less likely to get damaged. 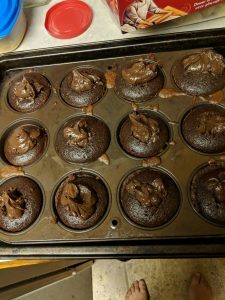 I bake enough to justify spending a little bit of money on a stand mixer, they are somewhat pricey so I wouldn’t recommend spending that amount of money unless you’re sure it’s something you’ll use frequently enough. Whisks though are inexpensive and they do work to mix up your ingredients with a little bit of elbow grease. Another great option if you can’t quite afford the dive into a stand mixer is to look for a hand mixer, you can generally find one for about $30 that will do the job and save your arm muscles. So those are the basics, you might find specific recipes call for a little bit more and that’s usually when I either decide not to make it or go out and get what I need. Simple as that. So now that you have some equipment, you need some inspiration to start creating! Cookies are super easy to make and are the perfect finger food, which is why I love them and why they’re the first thing on this post. One extra thing you may wish to look into is getting a selection of cookie cutters. The most common ones are just plain metal, but for a little bit more money you can find a whole selection (again Walmart, Michaels, Amazon…if you’re in the States, Joanns, Hobby Lobby, etc). The plain metal ones work just fine. It’s really up to personal choice. I found these cuties on Pinterest. Cincy Shopper has taken the peanut butter cookie (in my humble opinion, one of the yummiest of cookies) and dressed it up a little using a Reese’s peanut butter cup, some edible eyes and some chocolate “legs”. 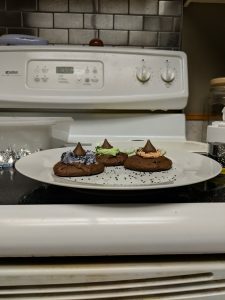 Betty Crocker has taken a classic chocolate cookie and topped it with some fun icing and a Hershey’s kiss to make adorable little witches hats! Sugar cookies are right up there with peanut butter cookies. Instead of baking a dozen cookies, you roll the dough out into a pizza shape and decorate it with some cool Halloween colored icing. Check out the full recipe and details at Lil’ Luna. One of my favorite Halloween movies is Hocus Pocus, so of course, when I saw these in my feed, I just had to learn more. Whisky + Sunshine has all the details on how to make these unique looking cupcakes! Devil’s Food is my favorite kind of chocolate cake so, I immediately gravitated toward these cute creations from The Crumbly Kitchen. The idea of adding a little cinnamon and cayenne pepper to the icing for some spice is ingenious! Hungry Happenings has put together some adorable werewolf cupcakes using Reese’s cups. Pumpkin AND chocolate? Yes, please! Check out all the details from Baking a Moment. Basically, it’s a layered cake with alternating layers of delicious pumpkin and chocolate cakes and topped off with an excellent chocolate glaze! This one is a bit more intricate, but it looks amazing and sound delicious. Love and Confections put this recipe together and I can’t wait to give it a whirl! This is a gorgeous cake. Domestic Gothness has all the details on how to make this ridiculously gorgeous gothic cake! Alright, so that’s all for this week, I hope this article is inspiring to you, if so, please share in on your favorite social media platform. You can also feel free to share in the comments down below, I’d love to hear from you, tell me your favorite Halloween dish to prepare! Next week will be a post about Last Minute Halloween Decor Ideas, so until then, happy crafting.